Thursday October 17th 1889 I went over to Venes the first thing this morning and stayed till nearly four oclock. I then called at Duncans and Bakers before going back to Joes to stay all night. 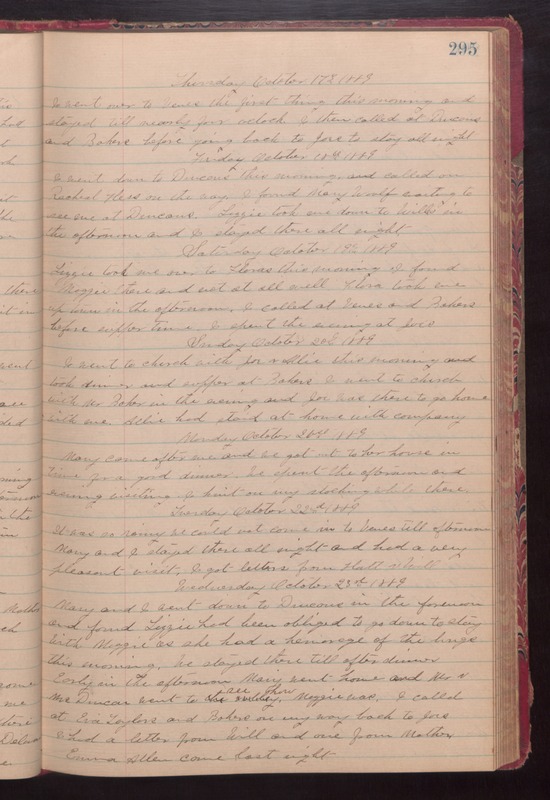 Friday October 18th 1889 I went down to Duncans this morning and called on Rachel Hess on the way. I found Mary Woolf waiting to see me at Duncans. Lizzie took me down to Wills in the afternoon and I stayed there all night. Saturday October 19th 1889 Lizzie took me over to Floras this morning. I found Maggie there and not at all well. Flora took me up town in the afternoon. I called at Venes and Bakers before supper time. I spent the evening at Joes. Sunday Octoberr 20th 1889 I went to church with Joe & Allie this morning and took dinner and supper at Bakers. I went to church with Mr Baker in the evening and Joe was there to go home with me. Allie had staid at home with company. Monday October 21st 1889 Mary come after me and we got out to the house in time for a good dinner. We spent the afernoon and evening visiting. I knit on my stocking while there. Tuesday October 22nd 1889 It was so rainy we could not come in to Venes till afternoon. Mary and I stayed there all night and had a very pleasant visit. I got letters from Hatt and Will. Wednesaday October 23rd 1889 Mary and I went down to Duncans in the forenoon and found Lizzie had been obliged to go down to stay with Maggie as she had a hemorage of the lungs this morning. We stayed there till after dinner. Early in the afternoon Mary went home and Mr & Mrs Duncan went to see how Maggie was. I called at Eva Taylors and Bakers on my way back to Joes. I had a letter from Will and one from Mother Emma Allen came last night.